God, Nooooooooo! 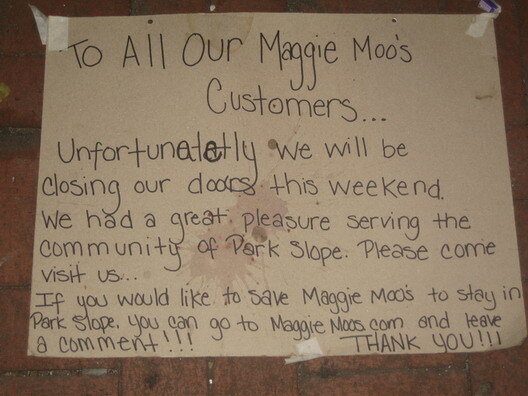 Not the Park Slope Maggie Moo's. 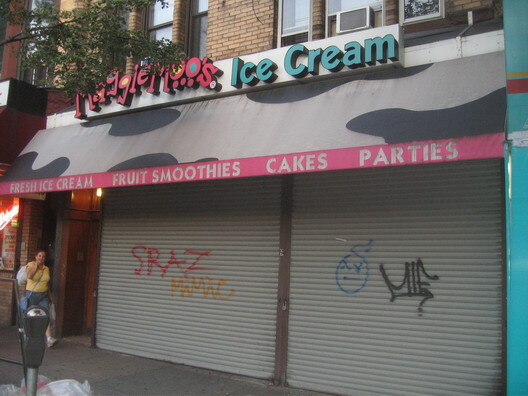 As you can see from the signage, the Park Slope Maggie Moo's has gone to the big frozen dairy treats factory in the sky. Strolling Seventh Avenue yesterday evening, we watched as a woman crossed Second Street and pumped her fist angrily at the gated ice cream spot. Strange time to be closed, we thought. Then, we looked down and found the sign above taped to the sidewalk. If Maggie Moo's can't survive in this storefront of death that has now swallowed up three establishments in the last five years, what can? The person responsible will surely live out eternity in a Circle of Hell Reserved for the Lactose Intolerant Who Disregard Their Lactose Intolerance. We leave it to your imagination what happens there. Is this ironic or sincere? The place was always empty. When people want basic ice cream in the basic Slope they always go to Haagen Dazs or Fat Louie G's. Being third in with a not-so-appetizing and overpriced menu didn't help. Possibly, Maggie Moo's closed there because their ice cream is terrible. Now if only someone could do something about the laundromat at 7th Ave and 1st St. that has seen new dryers sitting in the middle of the room, unconnected, since February as the rest of the place goes to seed. The second time I went, (yeah, I gave 'em a second try) they were slammed, but they only had two overwhelmed and unmotivated employees. This place was run very badly, the employees were nice and good, but whoever was running this thing was bad. Most of this summer the freezers weren't working and the last few times I went they couldn't even serve me. Good riddance. I've gone two times when they couldn't "chop" the ice cream, because it wasn't frozen enough. I'm all for conserving energy and all, but it's weird for an ice cream place to not keep it cold. Every time I tried to go there they were closed. I'm no expert but it would seem to me that a desert place would make more money if they were open during after-dinner hours, at least during the summer months. Since I love Oko so much, I'll root for Gorilla! Another coffee joint? You can't be serious. I for one hope we get a "Hookers 'N Blow"
An unneeded place that served overpriced crap! From the product being served to the untrained, surley & inefficient slackers behind the counter. I worked there for a summer before leaving for college- it was easily the worst job I had ever had. They treat their workers miserably- I was stuck in the cow suit and made manager and refused a promotion. The ice cream was disgustingly unsanitary (I'd never eat there), and if I had to listen to one more 'team pep talk' and be excited about ice cream that comes in colors not found in nature- I was gonna vomit in the mooberry.